The Desktop Certificate Display is the perfect way to show off your golf ball and Hole-In-One certificate. 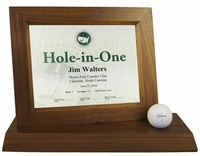 This attractive solid walnut display includes your 6" x8" National Hole-In-One Registry certificate. If you have not registered for your certificate Click here to register! To learn more about the First Tee organization Click Here.